ZOODLES!!! Eating Gluten Free? Zoodles. Looking to up your fiber intake? Zoodles. Watching Calories? Zoodles. Enjoy tasty, healthy food? ZOODLES! Noodles made from zucchini or yellow summer squash are a fantastic alternative to wheat pasta. We call this a salad, because technically it is. However, you may find that you don’t miss the wheat pasta at all. Zoodles eat just like spaghetti and take Italian Flavors brilliantly. Here, we pair zoodles with a bright and lemony Pumpkin Seed and Sage Pesto Sauce. No Name Brand Salmon Filets taste fantastic with it too. If you miss pasta, this recipe will be just dandy with the real thing. But give zoodles a try. You’ll be surprised how tasty eating healthy can be with No Name. Look for spiral vegetable cutters in the kitchen wares section of most major retailers. It is easy to make zoodles at home out of zucchini or yellow summer squash with these small tools. Many grocery stores are now carrying them as well! Find spiral cut zucchini in the cut vegetables case in your grocer’s produce section. Prepare your salmon filet in the oven according to package instructions. Cook salmon filets according to package instructions. When salmon is cooked, place zoodles in a bowl. Toss with Pumpkin Sage Pesto. Use enough of the pesto to coat zoodles evenly, as if they were pasta. Divide dressed zoodles in half and place in center of serving plates. Place cooked salmon on top of the zoodles. Arrange tomato wedges around the salad. 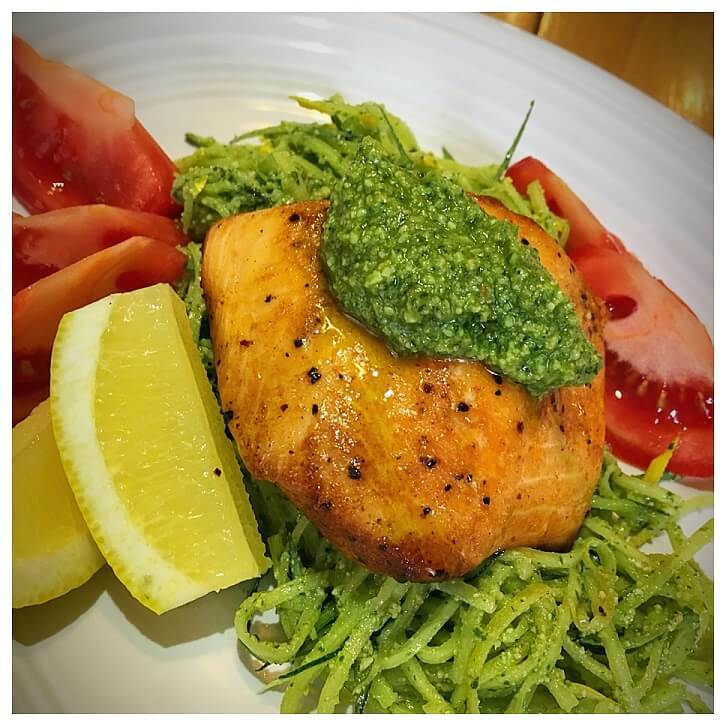 Top the warm No Name Brand Salmon Filets with a dollop of the Pumpkin Sage Pesto. Serve with lemon wedges and garnish with more Toasted Pumpkin Seeds, if desired. Place all ingredients into a food processor and blend until uniform. Adjust seasoning, if necessary, after blending. Left over pesto sauce can be frozen for future use!